Kids use their cutting skills to build a cool snowman on this prekindergarten worksheet. This worksheet helps build fine motor skills and shape recognition. These homemade valentines are a great surprise for classmates, friends and teachers! Review important traditions and talk about new ones with your little one while you set up a play food seder. Learn the letters of the alphabet and the names of animals that begin with each letter. Then add colour and turn this worksheet into a placemat! 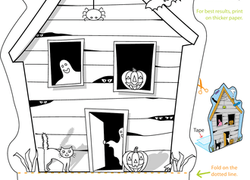 This haunted house worksheet shows you how to make a 3D haunted house using only paper and tape. Try this haunted house worksheet this October. Does your preschooler know where different types of vehicles belong? Cut out the pieces and have your child stick them on the picture in the correct places. Your child will love putting together his own elephant with this cute cut-and-paste project. He can make his elephant as realistic or wacky as he wants. Yum, this printable play food set is making me hungry! Give your child a fun craft, where she can make her own sandwich play food. Your preschooler may not want to make a healthy lunch, but maybe he'll like cutting and pasting one together. Turn a paper project into a simple health lesson. Colour in the letters then write your name in the space reserved. Then turn the worksheet into a placemat that will not be mistaken for anyone's but yours! Rain or shine, this paper doll will be ready for any weather! Help your young learner get familiar with the seasons and weather with a fun activity. 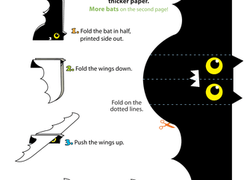 This fun, affordable craft project makes a great Halloween decoration project. Have you ever heard kids complain that there isn't a holiday just for kids? Learn about koinobori with this fun holiday worksheet. Tap into your emotions with these cut-n-build descriptive dice! Couple these dice with our animal dice for a great language activity. Cut and paste to make a collage of your child's favorite things ... all in one place! Learn the alphabet and the names of delicious vegetables that begin with each letter by completing this coloring activity that can also be used as a placemat! Find all of the desert animals in the worksheet and see if you can name them. Then add colour and turn it into a placemat! Mama mia! Get ready for some fun food play-time, with this homemade pretend pizza kit! Your child will have 5 pages of pizza toppings to mix and match. Your preschooler can make her very own B book using images of things that start with B sounds. Cut out the pictures and help your young one sound out the words. Use pictures of things that start with a G sound to put together your own G book. This Christmas puzzle will bring some holiday cheer to your game night. Make a festive Christmas puzzle with your child this holiday season. Printable Christmas ornaments get you set up for some quick Christmas cheer. Make some printable Christmas ornaments with your child this holiday season.